Some, but not all, of the things I've built which other people might find useful. My github profile contains additional work. 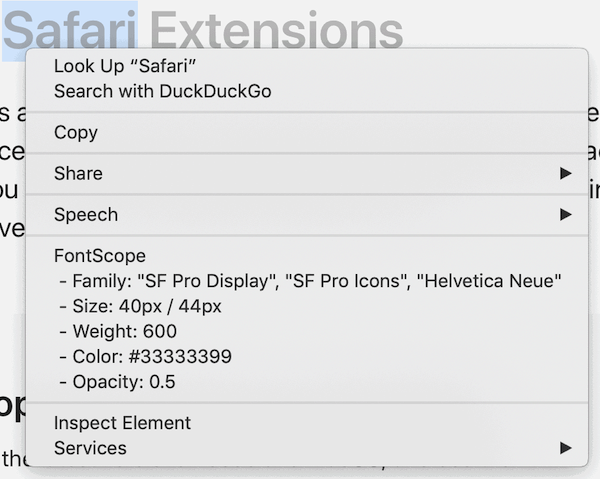 A Safari extension to easily view an element's CSS font properties via right click. Easily create Gists from your clipboard contents or selected file. Perform DNS lookups using dig. I have had the opportunity to contribute back to the open source community throughout my career. Below is a sampling of that work. Ruby Client for Rustici's SCORM Engine 2017.1 API. Default app for use with Pow.cx that lists/links your other apps. Workflows for Alfred to perform DNS lookups using dig, manage Pow, and create Gists. My github profile contains additional work.